This was the second half of day four of my east coast Rush tour. 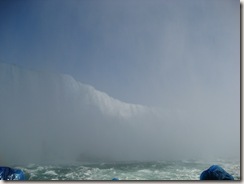 After Port Dalhousie, Monica and I drove to the Niagara Falls area. First, we drove around on the Canadian side of the Falls, which looked more like Las Vegas, with its hotels, casinos, and flashing tourist traps. 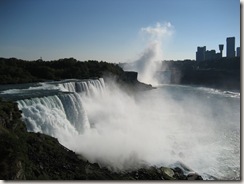 The falls themselves were in the distance, a cloud of water vapor rising up like smoke. After a twenty-minute wait, we crossed the border to the American side, which seemed more run down, at least by the border crossing. After finding free parking, we walked over to the park alongside the falls. It was beautiful, but not what I thought it would be. I didn't realize that there are actually two parts to Niagara Falls -- Bridal Veil Falls on the American side, and Horseshoe Falls on the Canadian side. 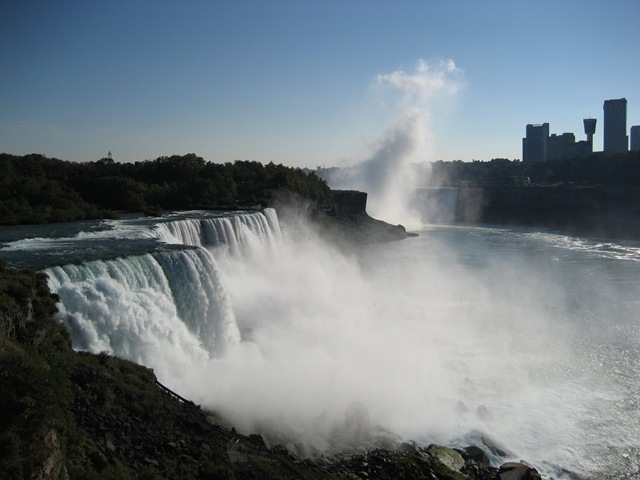 The image of Niagara Falls that most people think of is Horseshoe Falls. I learned that less than 10% of the water flows over American side. 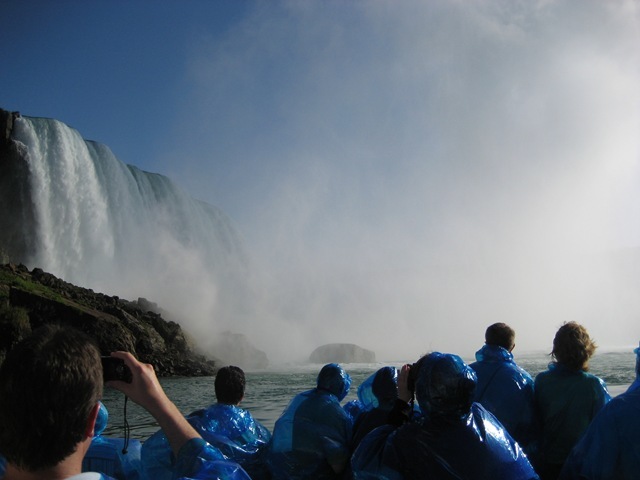 One of the recommendations I'd received from the locals was to take the Maid of the Mist boat tour, which travels past Bridal Veil Falls and near Horseshoe Falls. Monica and I bought our tickets, took an elevator down to the water -- where they give you a thin, blue plastic poncho, which you can keep as a souvenir if you want -- and waited in line for the boat. Our boat ended up being the "St. Catherines." 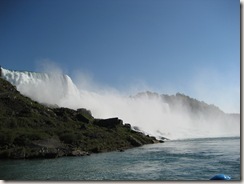 Once the boat left the dock, we floated by Bridal Veil Falls, and then headed toward the main event. 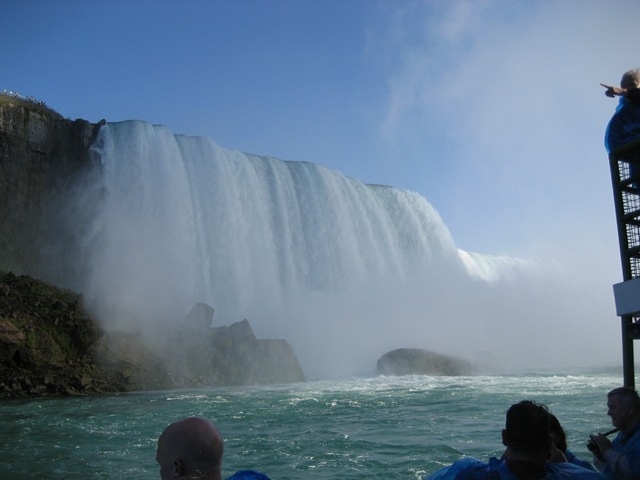 I wasn't prepared for how much Horseshoe Falls would overwhelm my senses. 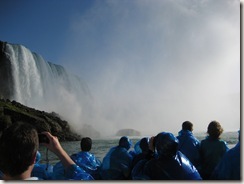 First, you're completely surrounded by a curtain of water that reaches up 170 feet (52 meters). The roar is deafening. The mist that looked like smoke from far away rains down like a spring downpour. The falls themselves are obscured by the mist, giving you the strange sensation that they could be only a few feet away or hundreds of feet away. 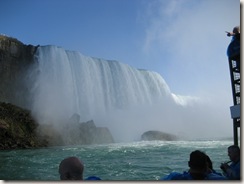 And the power of all that water coming down creates rapids that toss the boat like a bathtub toy. In that moment of communion with nature, I can honestly say I was awestruck. I later learned that the water flowing over the falls has been cut in half (from 5.5 billion gallons to 2.25 billion gallons per hour) to create hydroelectric power. 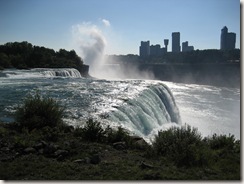 One startling fact is that Niagara Falls is the largest producer of electric power in the world. Finally, we took the elevator up to an observation platform and saw a great view of Bridal Veil falls, with the smoke rising in the distance from Horseshoe Falls. 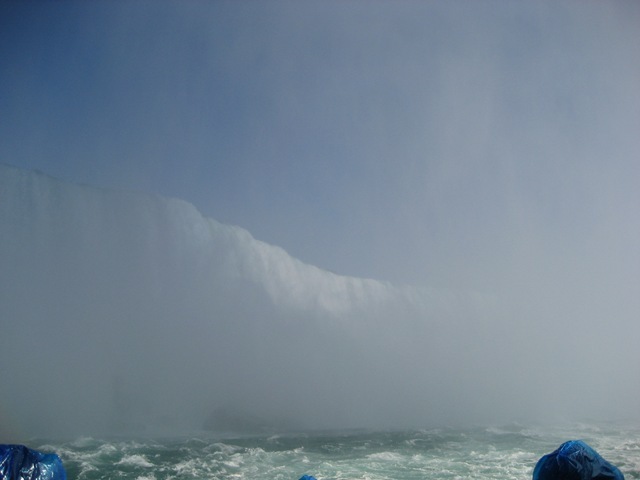 Niagara Falls has joined a select few natural experiences in my life that have left me speechless. The other experiences include: a total solar eclipse in 1979, a total lunar eclipse that I watched from Gasworks Park in Seattle, seeing the Grand Canyon for the first time, and seeing Mount Rainier for the first time. If you're ever in this area of the US, make sure you go out of your way to see Niagara Falls. Check out a webcam of Niagara Falls as it looks right now.